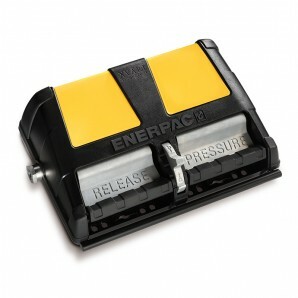 Enerpac air driven hydraulic pump features an ergonomic design for less operator fatigue. Variable oil flow and fine metering for precise control. Higher oil flow for increased productivity. Closed hydraulic system prevents contamination and allows pump usage in any position. Pedal lock function for retract position. Pump also features an external adjustable pressure setting valve, and is two speed. Enerpac XA-11 Air Driven Hydraulic Pump.